2017 Grammy nominees dominated by people of color. For the first time in the history of the Grammys, all of the lead artists nominated for record of the year are people of color. Photo illustration by Slate. Photos by Carlos Alvarez/Getty Images, Jason Koerner/One Voice: Somos Live!/Getty Images, Paras Griffin/Getty Images for BET, Frazer Harrison/Getty Images, SUZANNE CORDEIRO/AFP/Getty Images, MARK RALSTON/AFP/Getty Images, and Emma McIntyre/Getty Images. For the first time in the history of the Grammys, all of the lead artists nominated for record of the year are people of color. Meanwhile, in the album of the year category, four out of the five albums nominated are by artists of color—the most in more than a decade and a tie for the most in Grammy history. In the record of the year category, black artists Childish Gambino, Jay Z, and Kendrick Lamar are nominated for their singles “Redbone,” “The Story of O.J.,” and “Humble,” while Bruno Mars (who is of Puerto Rican, Jewish, and Filipino heritage) is nominated for “24K Magic,” and Luis Fonsi and Daddy Yankee (who are Puerto Rican) are nominated for their summer-conquering smash “Despacito” along with featured artist Justin Bieber. Over in the album of the year category, Childish Gambino, Jay Z, Bruno Mars, and Kendrick Lamar are all nominated for their most recent releases. The only white artist up for that trophy is Lorde, who is nominated for her sophomore album Melodrama. Meanwhile, the other two “Big Four” categories, song of the year and best new artist, are similarly dominated by people of color. Black rappers and singers Lil Uzi Vert, Khalid, and SZA are all up for best new artist, where they will go up against Alessia Cara and Julia Michaels. 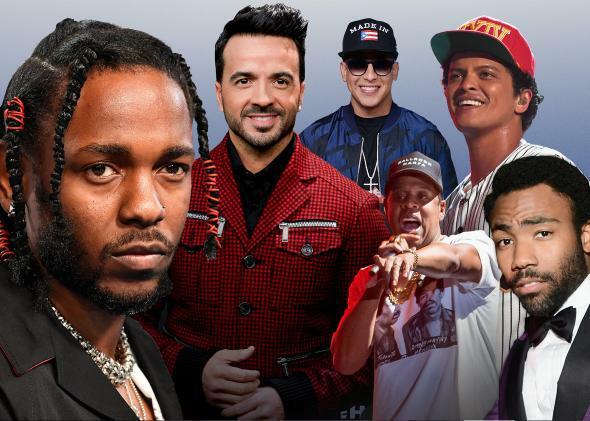 Songs by Jay Z, Bruno Mars, and Luis Fonsi and Daddy Yankee are all up for song of the year. Progressive music fans who are looking for reasons to be more pessimistic might note that these nominees are also mostly men, and that’s true. However, the increased racial and ethnic diversity of these nominees can’t really be blamed for that, because it’s also nothing new. In 2013, for example, the nominees for album of the year were all men, with Mumford & Sons winning over the Black Keys, Frank Ocean, Jack White, and fun. This year, at least we have Lorde. Others might wonder whether this is simply a response to #GrammysSoWhite. After all, when two years of all-white acting nominees led to backlash in the form of the #OscarsSoWhite campaign, the following year’s Academy Awards included the most black nominees it’s ever had. And I do wonder whether, without #GrammysSoWhite, we might have seen more major nominations for, in particular, Ed Sheeran, who had the best-selling 2017 album that was eligible for the award (Taylor Swift’s Reputation is the best-selling album of the year but won’t be eligible until next year) and one of the biggest hits of the year in “Shape of You.” Fans who spread the #GrammysSoWhite hashtag might count this one as a victory over the Ned Flanders of pop. But the Grammy nominations tend to follow the pop charts fairly closely, and since the rise of streaming, black people and other people of color have been taking back the pop charts. Nearly all of this year’s chart-topping songs were by people of color, from the Weeknd’s “Starboy,” Rae Sremmurd’s “Black Beatles,” and Migos’ “Bad and Boujee” in January to Cardi B’s “Bodak Yellow” this fall. This year’s nominees reflect that while recognizing some less commercially successful work such as Childish Gambino’s “Awaken, My Love!,” which has sold reasonably well but hasn’t spawned any Top 10 singles. Of course, this doesn’t necessarily mean that the nominations won’t lead to another night of heartache for music fans tired of watching staid white artists win again and again in an industry largely built on the musical innovations of people of color. Last year, after an apologetic Adele beat out Beyoncé and others to sweep the top categories of album of the year, record of the year, and song of the year, Slate music critic Carl Wilson noted that this has become “the Grammys’ current pattern: use black performers to draw viewers but bypass them for the main awards.” After all, Kendrick Lamar has been nominated for Album of the Year twice before with two instant-classic, game-changing albums, only to lose out to Daft Punk in 2014 and Taylor Swift in 2016. And certainly it’s possible that, in that category in particular, something similar could happen once again: Fans of R&B and hip-hop could split their votes between Childish Gambino, Jay Z, Kendrick Lamar, and Bruno Mars, leaving Lorde to run away with the night’s final award. But in at least one of this year’s biggest categories, that won’t be possible. No matter what happens on “music’s biggest night,” there’s one sure thing: An artist of color will win record of the year. All of which leaves one possible solution to the Grammys’ old pattern: just stop nominating white artists.